An allergy to fleas is one of the most common skin diseases affecting dogs and cats. The most important part of treatment for flea allergy is killing the fleas already on your pet and preventing others from infesting your dog or cat. In some cases of flea allergy, your dog or cat may be so uncomfortable that additional symptomatic treatments are necessary to relieve the pain and inflammation associated with the allergy. Successful treatment of any flea allergy requires getting rid of the fleas that are currently feeding on your dog or cat and keeping additional fleas away from your pet. However, there are several factors to consider in planning a flea control program. There are many different products available that are safe and effective in controlling fleas. These include Frontline Plus®, Advantage®, Revolution® and many others. Follow label directions carefully when using these. 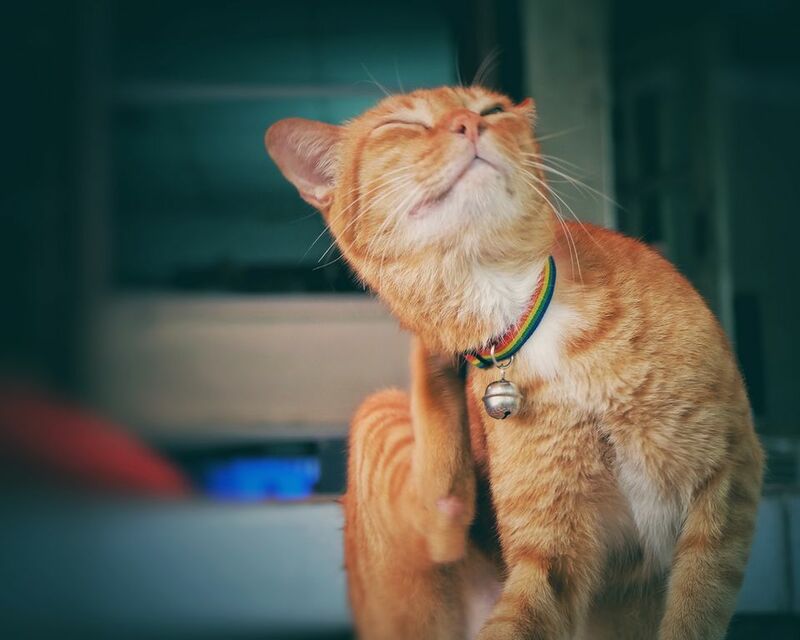 Flea products such as Capstar® and Comfortis® are sometimes recommended to treat dogs and cats with severe flea infestations that need relief quickly because they are able to kill fleas more quickly than some of the other flea control products, usually within a matter of hours. While these flea control products work to kill the fleas inhabiting your dog or cat, they do not kill the larval forms of the fleas that are present in your home. For this reason, it can take several months before a flea infestation is finally completely under control when only these products are used. Flea eggs and larva can live in your home and can survive for long periods of time. Regular vacuuming of all surfaces can help remove these eggs and larvae from your home. Be sure to move the contents of the vacuum bag outside of your home after you have vacuumed. Wash any bedding that is washable. Hot water is preferable, if possible. Remember that fleas can also inhabit crawl spaces, low hanging vegetation and other sheltered areas outside. You may need to either restrict your pet's access to these areas or treat the areas to kill the flea population there. If your dog or cat has been scratching constantly because of a flea allergy, it is possible your pet may also have developed a secondary bacterial or yeast infection. These infections can occur when the skin becomes traumatized or damaged. Secondary infections can contribute to the amount of itchiness your dog or cat is experiencing. If a secondary infection is present, it will need to be treated with an appropriate antibiotic or anti-fungal medication. In some cases, your dog or cat may become so uncomfortable from the allergy that additional relief is necessary to reduce the itchiness caused by the flea allergy. Your veterinarian may recommend a short course of treatment with anti-inflammatory medications, such as antihistamines or corticosteroids. In these cases, it is important to weigh the benefits of using the medication against the risk of side effects that can occur due to the medication. When used at all, corticosteroids should be used at the lowest dose possible and only for a short period of time. Many veterinarians do not condone the use of corticosteroids in these situations while others use them cautiously. There are many myths that exist about fleas. Myth #1: "I don't see any fleas on my dog or cat. This cannot be a flea allergy." The truth is that many pets are very good at removing fleas. Not seeing fleas on your dog or cat does not rule out the possibility that fleas are contributing to a skin problem. Myth #2: "It's winter-time and it is freezing outside. My dog or cat cannot have fleas." The truth is that fleas can survive the winter very easily inside of your home. In addition, they can also survive in sheltered areas outside throughout the winter as well. Often, wild animals bring fleas into sheltered areas when seeking shelter from the elements themselves. Myth #3: "There is no reason to continue using flea control if I am not seeing fleas on my dog or cat." The truth is that preventing a flea infestation is much easier than trying to control an infestation that already exists. Using monthly topical products year round is often the most strategic method to control fleas. If your dog or cat is suffering from a flea allergy, controlling the fleas on your pet and in your home should be your first priority. Are You Feeding Your Cat in the Right Kind of Bowl?